Introducing your dog and your baby is a very important process in socializing your pet to your new family member. In this article we'll try and give you several tips on exactly what to do to make this a pleasurable meeting for all involved. You've just had your baby and are probably concerned about how your dog is going to react to the new addition. That's to be expected. Introducing your German Shepherd to your new baby is an important process that needs to be done carefully! You want your dog to act appropriately around the baby when he/she comes home so lets break it down into 2 basic steps – preparing your dog for the infants arrival and introducing your dog to your infant. Getting your dog ready for your baby's arrival in advance is one of the best ways to help avoid possible friction or jealousy issues between your baby and your dog. Your dog is used to all your attention and pampering so don't be surprised if some jealousy surfaces when your new baby becomes the center of attention. Taking some precautions ahead of time, a few minutes of quality time and some extra treats can go a long way when introducing your dog and your baby for the first time! • Encourage friends with infants to visit your home to accustom your pet to babies. Supervise all pet and infant interactions. • Take your dog to your local Veterinarian for a complete checkup a few months before the baby arrives. • Worms and parasites can be harmful to your baby so be sure to worm your dog before the baby arrives and at the normal intervals to keep on top of this problem. If your dog is not spayed or neutered, this is also the time to get it done. • Accustom your pet to baby-related noises months before the baby is expected. For example, play recordings of a baby crying, turn on the mechanical infant swing, and use the rocking chair. Make these positive experiences for your pet by offering a treat or playtime. • Allow your dog to explore the baby's sleeping, diaper changing areas, and related items such as baby powder, lotions, and diapers to become familiar with the new smells and objects. Apply baby lotion or powder to your hands, for example, and allow your dog to sniff the new smell. Dogs rely on their sense of smell, so familiarity with the new baby smells will help him or her recognize the baby as a part of the family. If possible, allow your dog to smell clothing that your baby has used before you bring the baby home. • Use a baby doll to help your pet get used to the real thing when introducing your dog and your baby. Carry around a swaddled baby doll, take the doll in the stroller when you walk your dog, and use the doll to get your pet used to routine baby activities, such as bathing and diaper changing. - Do not allow your dog to sleep on the baby's furniture or play with the baby's toys. Your dog should know that the furniture is not for him or her and should treat it as such. Provide toys for the dog that do not resemble baby toys. A dog may take the toy from the baby's hand and unintentionally injure the infant. - Finally and very importantly, be sure that your dog knows that you and your family are alpha over him or her – this is crucial to ensure you can reprimand your dog should any jealous signs show when the baby is brought home. Here's the next step in introducing your dog and your baby: The actual introduction of your dog to your new baby is really important and the first few meetings can often dictate how your dog responds to your baby in an ongoing basis. For this reason, it is crucial to undertake the dog/new baby introduction process slowly and properly. • When the baby comes home, another person should hold the baby while you greet your dog. Your dog has missed you and it is important to pay attention to him or her when you first get home. • Greet your dog happily and bring him or her a new toy as a gift to associate the baby with something positive. After your dogs excitement about your homecoming has dissipated you should start introducing your dog and your baby. 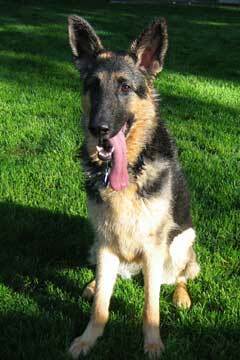 • If you are unsure of you dogs behavior, leash or restrain him or her during the introduction. Talk to your dog, pet and encourage him or her to get a good look and sniff the baby's hands and feet. Do not force a reluctant dog by pushing the infant in front of the pet. Allow the pet to explore the new smells at their own pace. • Never leave your baby unsupervised with your pet. An infant is incapable of pushing the animal away and your dog may inadvertently smother the child. The actions of a baby may scare your dog and cause it to bite in self-defense. If your dog reacts aggressively, put him or her in another room until it is calm and try the introduction again later. • After the initial greeting when introducing your dog and your baby, you can bring your pet with you to sit next to the baby; reward your pet with treats for appropriate behavior. Remember, you want your pet to view associating with the baby as a positive experience. Again, to prevent anxiety or injury, never force your pet to get near the baby, and always supervise any interaction. • Life will no doubt be hectic caring for your new baby, but try to maintain regular routines as much as possible to help your pet adjust. And be sure to spend one-on-one quality time with your pet each day - it may help relax you, too. With proper training, supervision, and adjustments, you, your new baby, and your pet should be able to live together safely and happily as one (now larger) family.